Where were we? 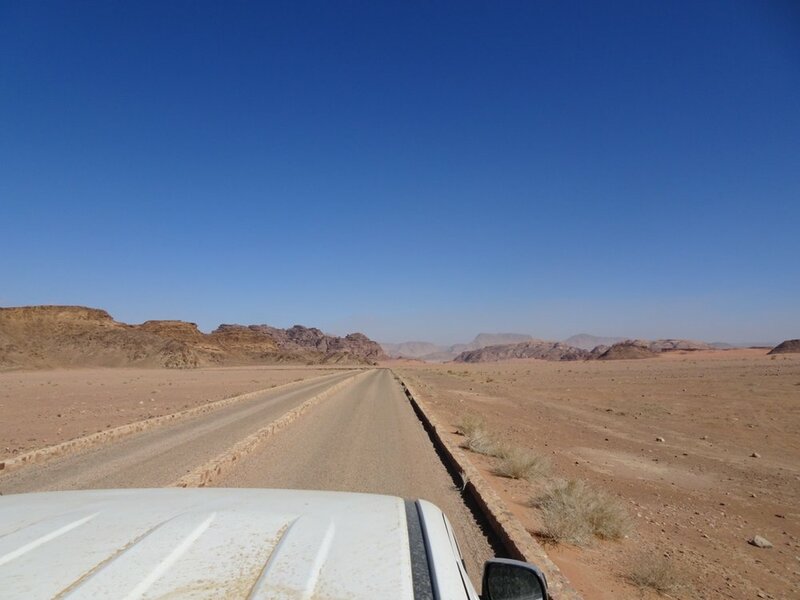 oh yes, we’d just left Little Petra and were on our way to Wadi Rum, national park and wilderness area forever associated with Lawrence of Arabia, it seems. 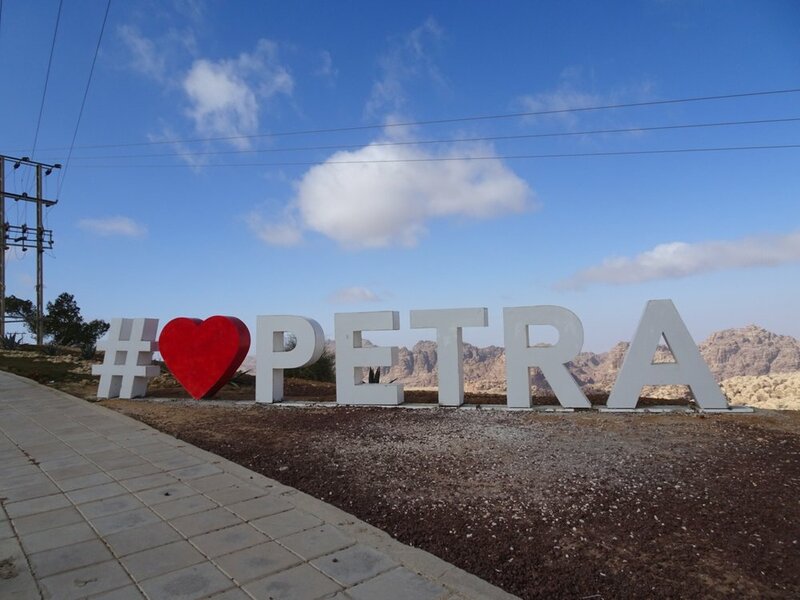 Our first stop was a viewpoint high above the valley where Petra is located and so we jumped out to take pictures and get a last glimpse. As we did, we shivered and shared a “Brrr!” moment for up here, it really was very cold. 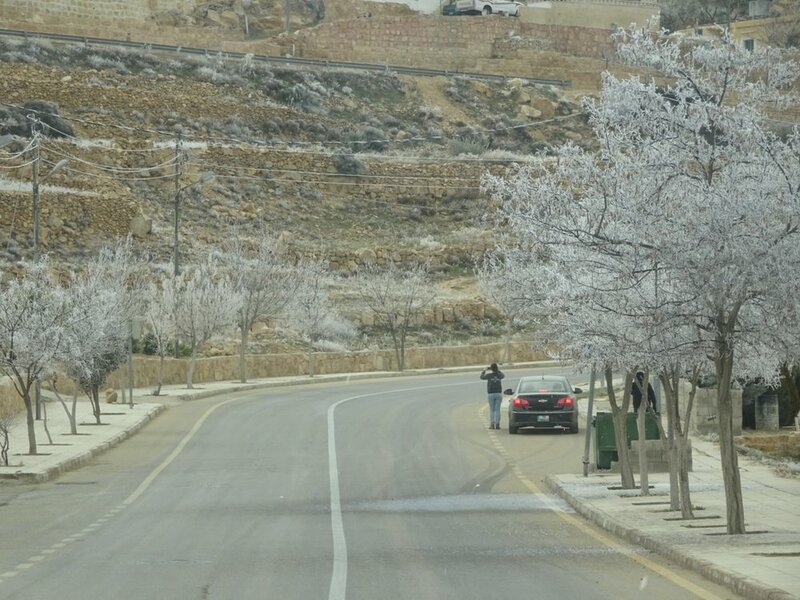 As we drove, we heard the hardf frost from the trees blowing onto the roof, but this was nothing - Mo’s wife had sent him a video of the six inches or so of snow that fell in Amman last night. But for us and for others it seems, this was rather surprising. 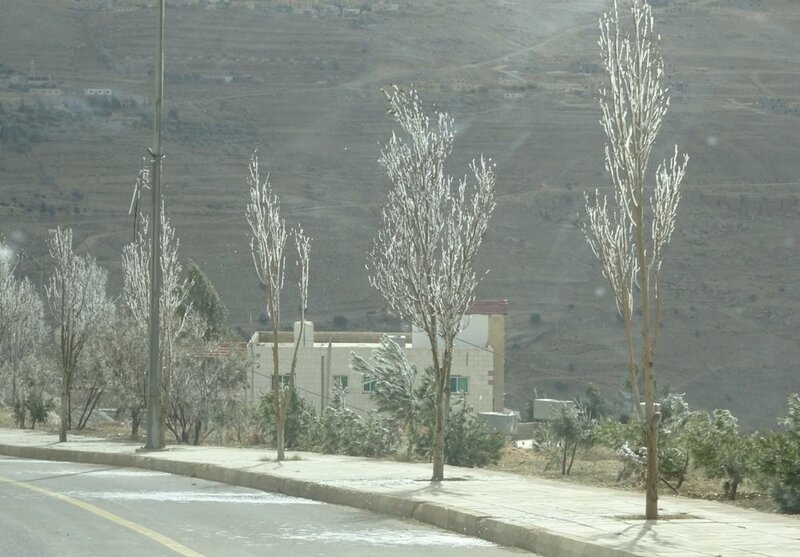 Though both Mo and Nabil said this was nothing unusual, especially bearing in mind we were nearing the highest road in Jordan. It felt strange to think that here we were at the highest point when later today, we’d be at negative altitude by the Dead Sea. 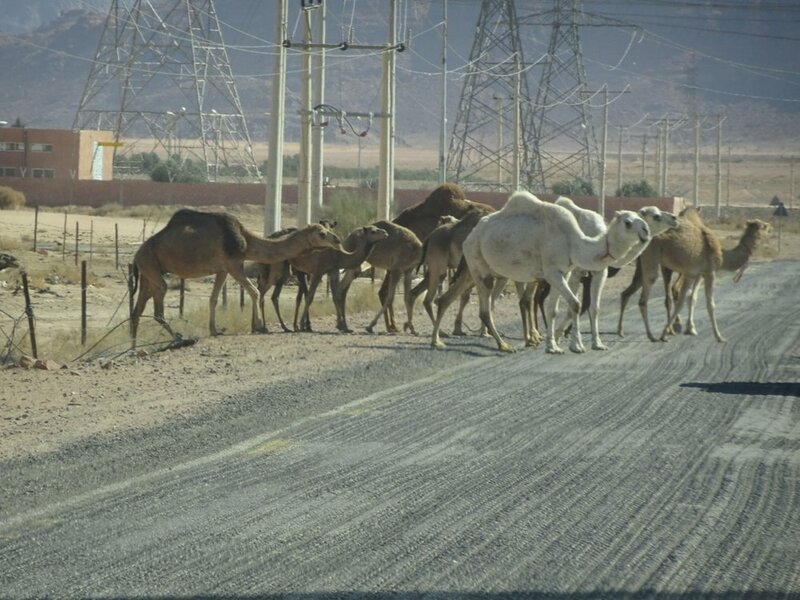 This herd of camels were walking softly across the road, taking their time as we enjoyed watching them. They’re graceful and elegant creatures in so many ways, yet - we were told - can be both loyal and spiteful. Our first stop was the visitors centre, where Mo went off to buy tickets, we said ‘bye to Nabil for a while and met our new driver. Saleh. The vehicle was given a light dusting - seat squabs beaten to get rid of the dust (as if!) and we climbed on board, into the back of the truck. What better place to be than high up in the fresh air? As soon as we set off, we were overwhelmed by the breathtaking landscape around us. What a glorious day! 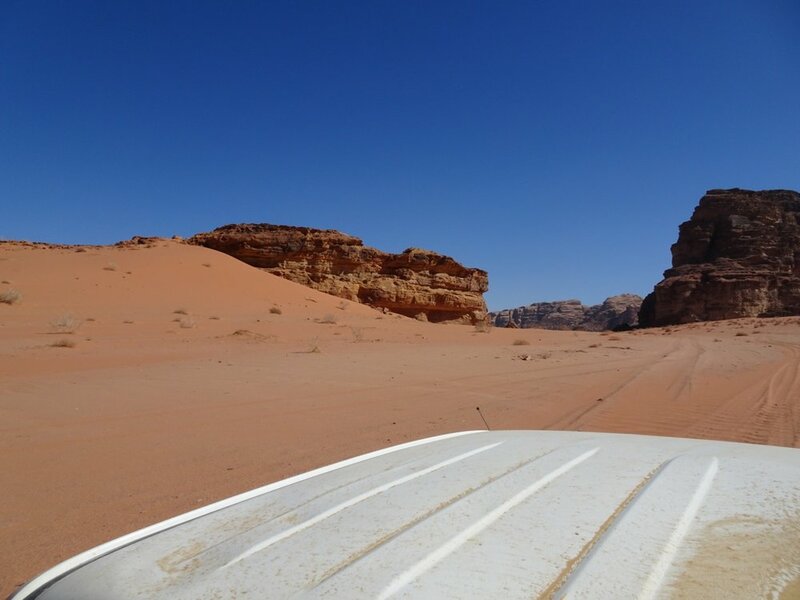 Soon we were off road and into the desert, passing the rock formation known as the Seven Pillars of Wisdom. The views were spectacular and we were enjoying the ride hugely - it appeared that we had the whole desert to ourselves - though of course, that was not the case at all. Our next stop was by this large sand dune. Would we like to climb it? Two “yes please” and two “No thanks”! So my Hero and I stood chatting to Mo and watching the youngsters make their way to the top as two more vehicles arrived and parked alongside. As soon as their passengers were off exploring, the three drivers turned up the music and we had an impromptu show - we have loved the way everyone here seems to have fun, to interact in a relaxed and easy-going manner. It makes a difference. This area of desert had been the base camp for the set of Martian and the recent Star Wars Trilogy. It’s easy to see how well suited this landscape is for such purposes, even though much can be achieved with CGI. Our next stop was to take a closer look at some petroglyphs, though the group of noisy camels standing nearby were doing their best to attract our attention. The offer of a ride received a “no thanks” from all four of us, though we were happy to simply stand and stare, to simply be here and absorb the whole shebang. I wandered around looking for an area of sand to photograph but struggled to find one without a tab end in it somewhere! I think I succeeded. 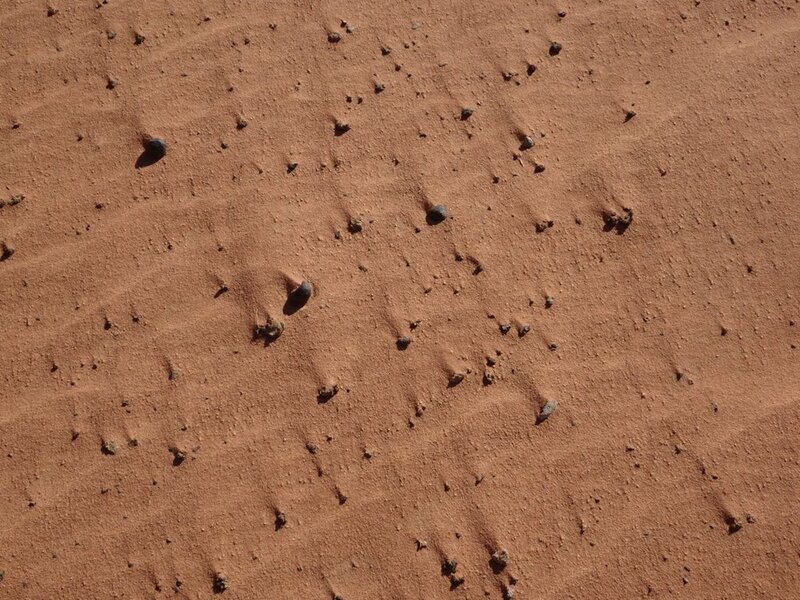 I was taken with the way the wind formed a pattern in the lee of each pebble, combined with the more usual ripples - it seemed unusual and distinctive, but then perhaps a tab end in there somewhere would be more authentic? We climbed on board once again and drove around the corner to another small valley where a series of Bedouin tents were to be found. Mo had explained the construction, of goats hair (short fibres, so not the easiest of weaving material) woven into patterns associated with each family. I was curious as to how the Bedouin were able to create such wide pieces of cloth - I had seen no evidence of a loom though I will admit, I hadn’t given it much consideration. Mo’s answer was that they set up the weaving in the ground…and a quick google confirmed that. After a delicious cup of tea in the tent, we continued on our trip, encountering not one, but two vehicles at the narrowest part of the course. Both filled with selfie-stick carrying groups of loud tourists, they were having a ball, especially when the two trucks drove alongside one another enabling them to photograph one another! The last stretch of our journey was through a valley filled with small encampments which Mo described as glamping. One of these is the Mars Camp but all looked pretty similar. We stopped at the Hasan Zawaideh Camp for lunch, spotting our own vehicle there in the car park and Nabil inside, waiting for us there. 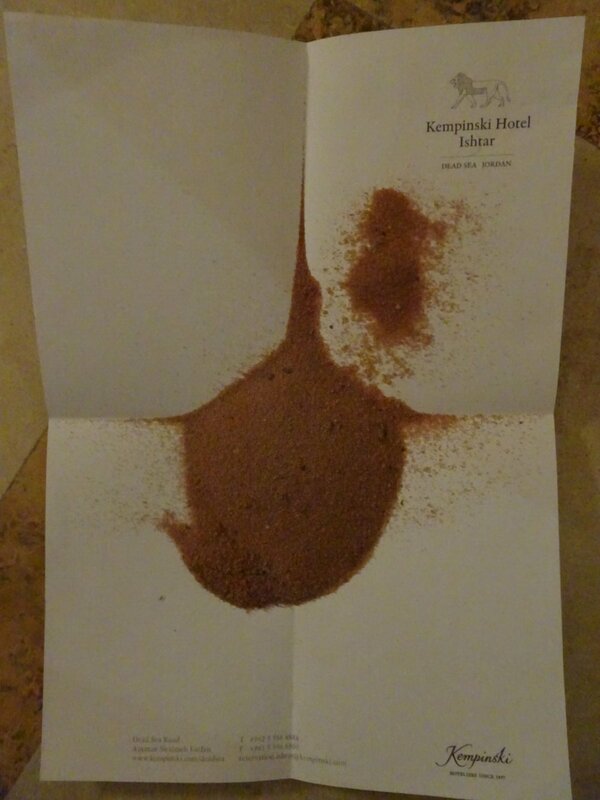 Another delicious lunch of maqluba or “Upside Down” as it’s known - a dish now rather familiar to us in a variety of formats, but none the worse for that. After lunch, we were back in a more familiar vehicle with Mo and Nabil up front. 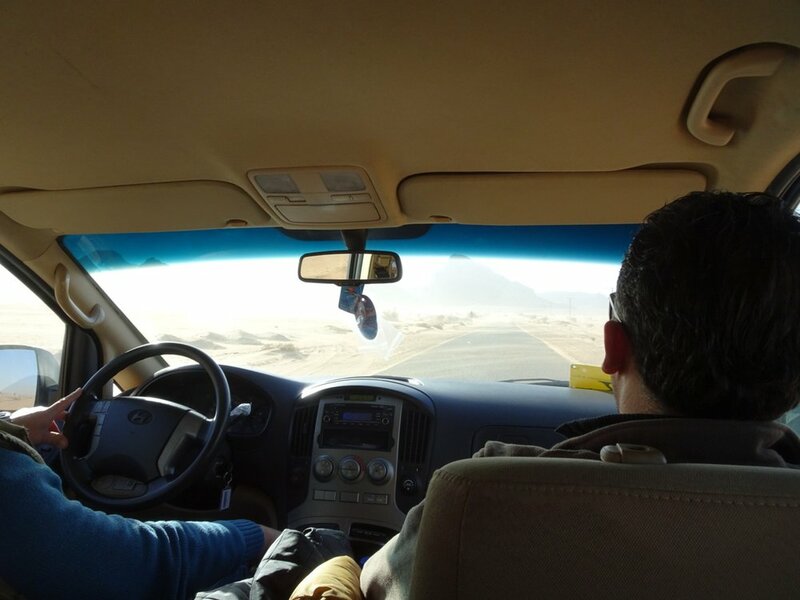 We said goodbye to Saleh and set off on our four hour drive to the Dead Sea. What might be termed as “interesting” driving conditions along the way and indeed, some “interesting” driving styles. We were glad to be in capable hands, I can assure you! Sadly, it was time to say ‘bye to Mo and Nabil when we arrived though - what an excellent pair they’ve been, both in terms of their professionalism and their great company. We settled ourselves into our beautiful rooms (having heard the magical word “upgrade”) and at last, I got to shake the sand from my shoes. There was quite a lot!